It's just that I get this feeling that their hobbies are a bit different. For one, they raise and breed Bernese Mountain Dogs (the current count at home is twelve). Maybe you've never had a dog, in which case I'll tell you that twelve dogs at home (or, if you want to be specific, four Labrador-sized puppies and eight full grown beasts) is like having at least fifteen human toddlers running around at your feet. Except that they have four legs, tiny teeth, and are fantastically strong. But wait—there's more! Hobby number two is running a backyard vineyard that, in conjunction with a friend's vineyard, produces about 7,000 bottles of wine per year under the brand Le Strie, or "The Witches," named so regarding the witch hunts that went on in the Lombardy region in the Middle Ages. The wine comes from the Nebbiolo grape, which we typically consume in the States as Barolo wine (poor me!). At any rate, these things are not what I call "hobbies," they are what I call "jobs." While most of these casks fit through the cellar doors, some had to be built in situ. Oh, hobbies. The Le Strie tasting room around the corner from the cellars is an old stone-walled jail, or carceri. I, on the other hand, haven't had a paying job in about 16 months and yet sometimes—sometimes—I actually feel like there's a lot on my plate. Should I feel ashamed? Probably. Speaking of plates, I guess Paolo does make the time for yet another hobby: cooking. Local peaches in a bath of honey and sweet white wine, the very Verduzzo Friulano that accompanied it. It seems that we just so happen to be volunteering with the Italian food poster boy. And once you resign yourself to the steady diet of black dog hairs that season each dish, you're in the clear. So if I can be literal for a moment, there really has been is a lot on my plate, and it's Paolo's fault. And on top of everything, the man fishes. These are locally caught river trout covered in herbs and thrown on the grill. I suppose we can add a third to Paolo's list of hobbies. Maybe I don't have to feel so bad about that after all. Stay tuned for some of Paolo's secret recipes! The truth is that it feels silly to try to explain any of this with words. Could there be any other idea of perfection than homemade hobo backgammon in the Italian Alps? The feelings stretch deeply to that pure and shiny spot inside of each of us that can only be described with the sound of belly-deep laughter or the sight of a dog sunning itself on a porch. Allow me to introduce you to lardo. This is straight-up pork fat, rubbed with local herbs and spices and cured in a salt brine. You should eat some fat every day, so why not keep it simple rather than hide fat in greasy potato chips or a slice of cake? Throw it on a warm piece of bread and watch the fat soften into sweet sweet salvation. Italian food just gets me. It makes me weak, speechless, giddy. It is food based simply on what is local and fresh. From there, you find the highest quality items among your participants, and then you cook with them. Could you ask for more? Porcini and sausage risotto with a side of bresaola (you can tell a man is choosing the side dishes here) All local, all amazing. I am volunteering as a way to travel. I am avoiding the "real world" and working for various families in exchange not for money, but for simple room and board. At least that's the gist. But what I'm also getting is culture. High in these alpine towns, the water comes straight from the source, leading to these pure and rustic "fountains" found all over the mountainside. When going for a walk, I just strap a cup to my belt and have mountain juice any time I please. Genuine Italian meals—cooked with the skill of a chef—twice a day. Carefully chosen wine served at dinner that is not only local, but moreover made from the nebbiolo grapes (i.e. the grapes used for Barolo wine) that literally grow in our backyard. Two generous and amazing hosts to work and eat with. A view of the Alps from my bedroom window. Twelve absurdly silly and friendly Bernese Mountain Dogs to play with at any given moment (and no, "twelve" wasn't a typo). Kitten bedding and a view of the Alps?? Hello, paradise. The original caprese salad (guess whose flag's these colors replicate? )...served with a side of local cheese. Cheese as a side for a cheese-based salad? This is getting serious. And in exchange? I have to find 25 hours at some point in the week to devote to helping to prune and arrange the vineyard. I can do these hours in three days and have the rest of the week off, I can do five hours for five days, etc...The arrangement is my choice. Spare time? Find the local gelato mobile (chasing it uphill under the midday sun optional, but highly rewarding). And so, with Paolo as our local master chef (and Marisa, his wife and official taster), I believe I'll have some recipes to be sharing with you. While the French take foods and spend hours concocting them into something new and rich and complex, the Italians just take what's good, keep it simple, and eat it. Bresaola "salad" and a view that'll make you cry. Case in point: Bresaola. This salt-cured, air-dried beef originated in the very Valltelina Valley that we currently call home. It comes from cattle that graze in the local Alpine meadows and since only the leanest, fat-trimmed cuts of meat are used, it ends up being a relatively "healthy" choice in the realm of charcuterie. The herbaceous mountain diet combined with the salt, herbs, and seasonings that are massaged onto the rind before aging it for two to four months produce a heartbreakingly flavorful end product. There is no need to incorporate this divine meat into some haughty dish. Slice it thin and eat it as it comes. Spread out the slices of bresaola on a plate, sprinkle on a handful of arugula, 7-8 hearty shavings of Parm-Regg, and a quick glug of EVOO and balsamic. Remember: keep it simple. No one ingredient should overpower the others, no matter how much you love cheese or want to try to be healthy with extra arugula. Savor the balance. Not an arugula fan? How about some local cheese and grapes, then? Coming up: fresh trout, local flavor, and way too many desserts. Sign up for Chowgypsy posts in your inbox! Rough translation: Happy Hour on steroids. After hearing from more than three people that Milan wasn't worth a visit, I almost didn't take the time to research the city and discover what they must not have: the elusive aperitivo originated in Milan. What may have begun as a few chips or mixed nuts accompanying a beverage has blossomed into a divine embarrassment of alcohol and "snacks" that are yours for the gluttonous taking. Find them (all of them!) from 6-9/10 p.m. all throughout this undervalued city. One Negroni, one Campari Fizz, and two plates of [relatively] free goodness. While there is a caveat—drink prices mildly increase—you still get a strong specialty cocktail and a hefty appetizer (or two . . . or twenty) for around €8. Easily the price of a cheap drink in New York. Before you hit the streets, don't miss The Rules section at the bottom of this post! We only had one day in Milan (see my guide to free Milan tourism), so we conquered all the must-sees while the sun shined, then went back to the hostel for a power-up (nap). If you want more neighborhood info, check out National Geographic's Walking Milan or Rick Steves Snapshot Milan . Afterwards, we set out at six o'clock to hit Milan's best bars for the aperitivo. After much research on the must-not-miss spots, I've compiled a map that I will boldly and aptly dub the Best Spots in Milan for Aperitivo Map, and yes, you should follow it. Since we had an all-day subway pass (only €4.50! ), we hit up the artsy Brera district, then headed down toward the bustling and popular Navigli area. check out the highly-reviewed purple points that we unfortunately missed. Always thinking ahead, we [vaguely] countered the effects of the forthcoming eating and drinking by hoofing it to Fioraio Bianchi (pink marker). Exercise, amiright?! Aptly-named for its switch from flower shop by-day into chic restaurant/bar by-night, the place is cooly panned in reviews for sub-par dinners. But you go for the aperitivo, not the dinner, dear fool! This is why you sleep in airports and eat homemade granola when hungry: so you can afford a night of aperitivos. Do not miss Fioraio Bianchi. The drinks were strong and the food was made with care. My first experience with a negroni (the house special) was literally mouth-numbing, and John was happy as a clam with his campari fizz. The gourmet grub is set out buffet-style, and oh what a buffet it is! By far it was the classiest food of the night and in the most intimate setting. We had eggplant lasagna, grilled vegetables, squid salad, cerignola olives, sauteed pork, and smoked trout, and more. Whew! The bartender even gave me a flower (I think he pitied my appalling Italian). You'll find Ristorante Claudio (green marker) up next on the map, but it's been reported as CLOSED FOREVER and I'm not updating the map, so I'm sorry. The metro then carried us and our newly-gained weight to the Navigli district. 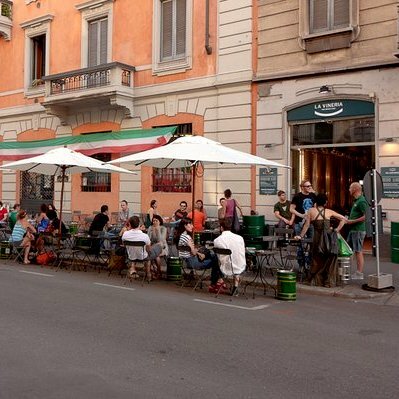 Unable to ignore the air's buzzing energy, we realized that this is the area where people flock for the aperitivo. The area itself is a bit grittier, but in that lovely way so unique to port cities. Come here if you want to mingle, be seen, eat a lot, and probably drink too much. Before you get too food-full, stop at La Vineria, a no-brainer for wine lovers. It serves regional wine and olive oil out of huge steel vats at "farmhouse prices," making two wonderful products more accessible to the average person and more sustainable for the average earth. The taste may be a bit farmhouse as well, but sometimes you just gotta get down on the farm. The plates looked simple yet delicious and considering that a bottle of house wine is five euros (during aperitivo), this might just qualify as the place of your dreams. You read it right: glasses of wine starting at one euro. Not to be lulled into a wine-eyed haze, we made our way to El Brellin (blue marker). Along the way we'd intended to stop by a recommended spot called Banco, but we skipped it when we saw that the aperitivo food was crudité and bread (come on). You will find that in a lot of the bars—they're catering to newbs and college student. Move it along, move it along. Such was not the case, however, at El Brellin. This traditional Italian restaurant doubles as a hip and economical spot for a relatively classy aperitivo. Plus, it takes advantage of its location on a tiny canal with extensive outdoor seating. The drinks are divine and while the buffet isn't exactly glamorous, it does offer some nice typical Italian options (let's just pretend we didn't see you, chips and salsa). The house special is the moscow mule (recipe here) and the word "special" does not even begin to describe it. Approaching El Brellin just in time for outdoor seating and a spot by their mini canal. This, my friends, is the Moscow Mule with three absurdly generous slices of fresh ginger. Crossing the canal, we looped around to a place called Slice. Again with the buffet. I'd been hoping to find a more personalized experience in at least one of these places, but it seems that most restaurants have hopped on the buffet train. I can't complain, though—it's easy to please a glutton. All this made me miss the time I spent eating in Granada. The buffet at Slice might have been the biggest yet (take that superlative how you want), but the unfriendly service and blaring techno music lead us quickly out of the bar to a boat/bar/restaurant just a short walk upstream called Il Barcone (yellow marker). Friends, rumor has it that this place has closed, and that's depressing. Although I hadn't done any research on this place (oh noooo! ), it was amazing. Despite being filled with people, our small table overlooking the clear Ticino River water was somehow quietly intimate. The buffet spread was bountiful with traditional Italian foods both hot and cold, and while my excitement on buffets had been waning since at least an hour before (and oh what an hour of suffering! ), we mustered up enough enthusiasm to make it through our plates yet again. Fresh cheese and celery leaves (hm? ), pork sautees, a few thick frittatas, pizzas, lots of fried things, fish sticks (...), and more! Succumb to the buffet. Purist foodie complaints about buffets aside, we certainly managed to enjoy ourselves, and so will you. If we're talking value for money, it's definitely all throughout the Milan aperitivo scene, and if you're going out for drinks anyway, why not hit the spots that have egregiously large buffets? There's bound to be something in there that that passionate Italian chef just can't refrain from putting his/her heart into. After Il Barcone, we got on our wobbly legs (was it the drinks or the river?) and began the walk home, where—lo and behold—we were intercepted by a gelateria. Cruel trick of the gods! Surely it is a rule that every Italian aperitivo trek should end with gelato. I think it's important to follow rules. Ronomata Gelateria, at the upper point of where all the canals meet, was buzzing and grand with its vintage decorations of cone-lined walls and golden cloches to cover each gelato. I sampled the dark chocolate (my standard test to decide if the rest is worth it), and decided on a definitive "yes." I'll note that this was our second gelateria visit of the day. So? And thus the night ended. When a shop doesn't even need to show you the product, you know it's gonna be good. I'll mention that loads of other small bars promising drink offers and proudly displaying colossal buffets lined the canal as we headed home from Navagli. I encourage you to cautiously assume that many of these places are full of tourists and unlovingly-made foods. I did my research, so trust the Chowgypsy. Otherwise, explore, be picky, and eat well. Some places have taken the aperitivo idea and flourished, others have taken it and completely missed the point. If you're on a study abroad trip, go ahead, eat your heart out for cheap, but if that's not the case, choose carefully. These aren't Golden Corral buffets. You are being trusted to serve yourself smallish appetizer portions of the food, so don't be a stupid tourist about it. The Italians typically pick up only a few bites worth of food. Try the restaurant's specialty drink (unless it's a cheap sugar bomb). If your goal is to see what Milan nightlife has to offer, pace yourself. Keep it to one drink per restaurant and that will also keep you from getting second helpings of food you've already tried. Most places do the aperitivo thing from 6-9pm, although some go later (how long has that food been out, though?). If you're on a mission to eat at Milan's best aperitivo spots in one night, be brave, be hungry, begin early, and pace yourself. Now that our Milan whirlwind is finished, we're heading to a small vineyard in Northeastern Italy to HelpX. Local wine, Bernese mountain dogs, and Italian Alps to come...stay tuned by signing up to my mailing list! Not ready to leave the computer? Check out my writer's blog at RoadWritten.com!